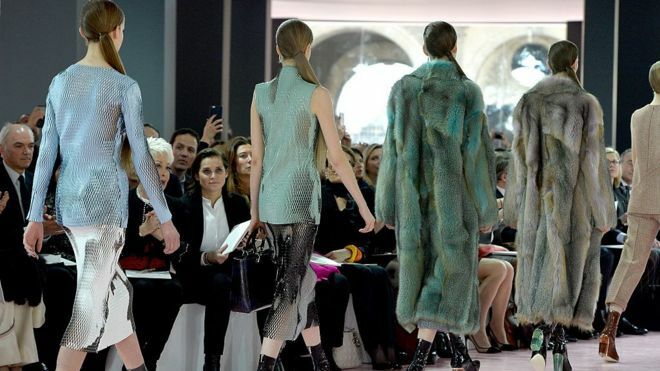 The fashion houses behind brands including Christian Dior and Gucci have said they will stop using underweight models for their catwalk shows. LVMH and Kering, two of the biggest fashion firms in the world, made the moveamid criticism the industry encourages eating disorders. Models must be bigger than a French size 32, which corresponds to a UK size six or US size zero, LVMH said. The firms will also not use models under the age of 16 for adult clothes. Kering’s billionaire chairman Francois-Henri Pinault said the firms hoped to “inspire the entire industry to follow suit”. The two French companies’ brands also include Givenchy, Yves Saint Laurent, Alexander McQueen, Marc Jacobs, Thomas Pink, Fendi and Stella McCartney. One of the other brands covered is LVMH’s Louis Vuitton, which was criticised by a model in May over her treatment. Danish model Ulrikke Hoyer said she had been asked to starve herself in the run-up to a show. The company denied the claim. Critics argue catwalk models promote an unhealthy and unrealistic body image, whereas fashion industry insiders have said clothes hang better on tall, thin women. Eating disorder charity Beat said: “The suggestion that the fashion industry are the ’cause’ of eating disorders oversimplifies the issue. In France, a law banning ultra-thin models came into effect in May. Companies could be fined up to 75,000 euros (£69,000) or its bosses jailed for up to six months if they breach the law. Models must also be able to present a valid medical certificate that they are fit to work. Kering and LVMH said their worldwide charter will go further, adding that models will be given a psychologist or therapist while at work. Mr Pinault said the companies wanted to make “a real difference in the working conditions of fashion models”. “Respecting the dignity of all women has always been both a personal commitment for me and a priority for Kering as a group,” the group’s chairman added. The companies’ changes will come into effect before Paris Fashion Week this month. This London Born Nigerian Chef Wants to Feed John Boyega but for Now She’s Happy to Feed The World! StarBoy to the World! Wizkid’s co-creation Jersey with Nike is Sold Out!